MANILA, Philippines – Families and friends of slain human rights workers Benjaline Hernandez (2002) and Eden Marcellana, and peasant leader Eddie Gumanoy (both in 2003) gathered today at the Bantayog ng mga Bayani to call on the Aquino government to implement the United Nations Human Rights Committee resolutions finding the Philippine government responsible for the killing of the three activists under Gloria Macapagal-Arroyo. 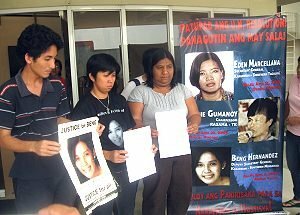 Relatives, friends and human rights advocate show the two UN resolutions on the case of Benjaline Hernandez, Eden Marcellana and Eddie Gumanoy during the gathering of families of victims at the Bantayog ng mga Bayani today, April 16, 2011. Shown in photo from left is a representative of the College Editors Guild of the Philippines, Megace Hernandez, sister of Benjaline and Glendhyl Malabanan and Secretary General of Karapatan Southern Tagalog. “This gathering serves as a renewal of our call for justice for Beng, Eden and Eddie, and to assert that the Aquino government should act on the families’ plight for justice to all the victims of extrajudicial killings,” Cristina Guevarra, Hustisya secretary general said. Gathered in the activity were the children of Eden and colleagues of Eddie, who were both abducted and killed on April 22, 2003 with a team conducting a fact finding mission on reported abuses by the military in Oriental Mindoro. Elements of the 204th Infantry Brigade, then under Ret. Maj. Gen. Jovito Palparan were the alleged perpetrators of the murder. Eden was secretary general of Karapatan-Southern Tagalog while Eddie was chairperson of Katipunan ng mga Samahang Magbubukid sa Timog Katagalugan (KASAMA-TK). Also in the gathering was Mary Grace Hernandez, younger sister of Beng, then secretary general of Karapatan Southern Mindanao when she was massacred with three others while also conducting a fact-finding mission on militarized areas in Arakan Valley, North Cotabato. “We hope that the UN resolution on the killing of Beng, Eden and Eddie shall serve as precedent on the possible filing of charges against Gloria Macapagal-Arroyo and other perpetrators like Jovito Palparan,” Guevarra said. Families and supporters also condemned the recent killings of Keneth Reyes, a barangay captain and member of Bayan Muna in Batangas and anti-mining activist and Anakpawis Partylist member Ricky Manrique in Compostela Valley. “The death toll under Aquino has risen to 45 in less than a year of power, the two recent killings not yet included. What is the message that these killings tell us? The injustice continues, and despite resolutions such as those issued by the UN, the state continues with its policy of extrajudicial killings. We demand justice, but at the same time, we demand to stop the killings,” Guevarra said.